Speaking a dialect of the Tewa language, they settled in the northern New Mexico region in the earlier part of the 14th century. Historically they are known for their agriculture, textiles, and pottery production. The Pueblo of Nambe was a primary cultural, economic, and religious center at the time of the arrival of Spanish colonists in the very early 17th century. 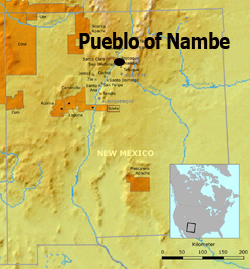 They were also one of the Pueblos that helped lead the Pueblo Revolt of 1680.The Pueblo of Nambe is recognized by the federal government and is an Indian Tribe that was organized under the Indian Reorganization Act of June 18, 1934. 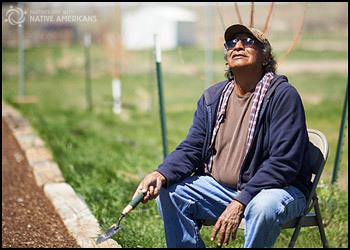 20 miles north of Santa Fe, the Nambe Pueblo is almost completely surrounded by non-Native American towns. They have almost 20,000 acres of land that are filled with cottonwoods, junipers, and oak. Weaving and pottery has become popular amongst the Nambe Pueblos today.